If you are in the vicinity of Wheaton, IL, you can avoid shipping and handling fees for your book or poster order. 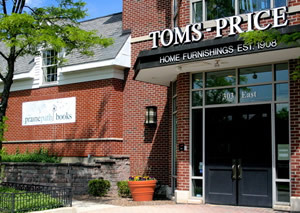 Pick Up is available every Friday from 11 AM to Noon, at Prairie Path Books, located inside Toms-Price Home Furnishings, 303 East Front Street, Wheaton, IL 60187. Enjoy a free cup of coffee with the author. She’ll be happy to sign your book. To order, just fill out the form below, and let us know how many books and posters you would like to order and which Friday you would like to pick up the books between 11 AM and Noon. Pay Natalie at the book store, using cash, check or credit card. Prairie Path Books is a cozy book store with 5,000 books, tucked inside Toms-Price furniture showroom. There is ample parking and nearby restaurants, shops, parks, banking, and train station. Please Fill out the form below to set up your local order. The order will be confirmed using this email. Natalie will call this phone number if she can't find you at the expected time. Please enter the quantity of Books and quantity of Posters you are ordering. If you have other comments, please put them here also.